Interestingly this could be said to be the only 'true' lake in the Lake District! Despite titles such as Lake Windermere, if you study the map all other 'lakes' in Cumbria have the title 'Water' or 'Mere'. Bassenthwaite Lake is unique in other ways too, it is a protected nature reserve containing a variety of fish including salmon, trout, roach, pike, perch, minnow, dace, ruffe, eel and one Britain's rarest fish the vendace is thought to be present. The protected habitat of Bassenthwaite Lake and the surrounding lands, brought about by various Trusts including the National Trust, Lake District National Park and Forestry Commission, working together has been rewarded by maintaining a natural balance in this corner of Cumbria. One of the most gratifying results of the Trusts work has to be the return of the Osprey who now regularly nest in the nearby woods and fish the Lake. Due to the conservation in this area fishing here is very restricted and campfires along the lake shoreline are prohibited. Bassenthwaite Lake is one of the larger Lakes at approximately 4 miles/6.4 km in length and 3/4-mile/1.2 km wide and perhaps one of the most shallow at 70 ft/21metres at its deepest. You may see the Bassenthwaite sailing club enjoying the lake which makes for a very pretty sight but please be aware that access is very restricted and a permit is essential. See more here. The Village of Bassenthwaite is set about a mile and a half east of the Lake with a stream running through and a lovely village pub. 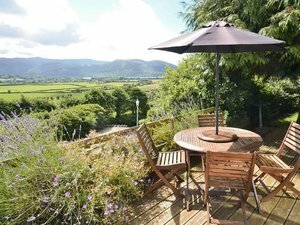 We've put together a selection of self-catering cottages in and around Bassenthwaite for visitors wanting to experience real Cumbrian Village life, away from all the tourist traps and perhaps a mobile signal too! Have a fantastic short video showing the new Osprey nest at Bassethwaite. The link below opens into a new tab to take you to the Cumbria Live TV website. Fly through the woods above Bassenthwaite Lake at Go Ape.